: when I was about seven years old. "My Message to Elvis": That he was probly the greatest performer of all time and a huge inspiration and without him music would not have been the same. : I like 'don't be cruel' because it has a good beat and I like performing it. Jailhouse Rock is my fovorite movie because the songs are great and he's a rebel. : I like his 50'suits like the gold lame suit but in the later years I like his american eagle suit. : Definately his family.His mother was his inspiration. : I wasn't born yet I'm only 16 years old. : He is a legend and there has never been another with his talent and ability to attract all age groups. 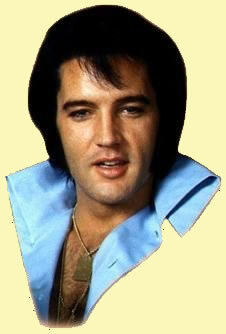 :: Would you like to tell us a little bit more about yourself to share on your own Elvis Presley Fan page? : my name is johnny parker and i'm 16 years old and love performing his music and like dressing like him on a daily basis and have been told I look like him tons of times except I'm 7 or 8 inces shorter.I'm an expert practically on him. : Big colorful pictures and posters. Thank you for your comments on our survey. It`s not hard to admire such a man with so much to offer Elvis will always be part of our lives. Sounds like you are a serious fan who loves to express your devotion by honoring the King through your own performances. I`m sure it`s an unforgettable feeling visiting Graceland, thank you for sharing your experience on your trip to Elvis` mansion. Out of all his movies, Jailhouse Rock was the one that Elvis totally enjoyed; he enjoyed the full on movement involved in the film. Elvis was the greatest, and still is`! He never forgot his upbringing, he loved his family, fans and always helped those less fortunate. There will never be anyone quite like him ever again. Once Elvis has touched your heart, that`s where he will stay. Great hearing from you Johnny, take care! Below are the lyrics to your favorite song` Enjoy! Description of site contents: This site contains Elvis Presley biography information, history on Elvis Presley life story, Elvis Presley pictures and photos, Elvis Presley song lyrics, Elvis Presley movie resources, free e-books and articles listed for your convenient search in subjects of: Elvis Presley pictures and photos, Elvis Presley biography song lyrics, Elvis Presley movie resources, Elvis Presley childhood, Elvis Presley Band members biography, Elvis Presley girlfriends, Elvis Presley spiritual medium stories, Elvis Presley Memphis mafia stories, Elvis Presley diary quotes, Elvis Presley biography movie and music details in relation to the Elvis Presley autobiography and interviews of friends and family members for the Elvis Presley biography website written by a fan for his fans.